The holidays are over, the kids are gone, and we are feeling a little despondent. We so love this time of food, family, generosity—oh, the world needs more of this homely virtue—twinkling lights, and, yes, beauty. 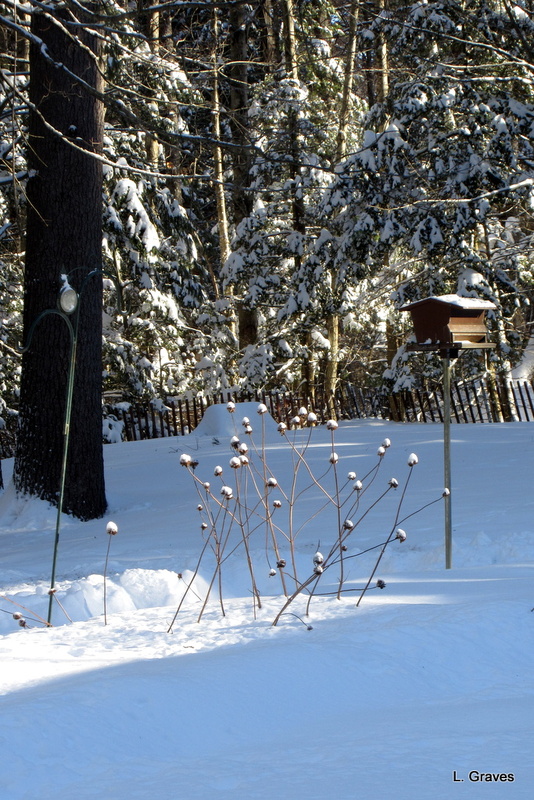 Winter is one of the most beautiful times in Maine, and on a clear day, the skies are so blue that I feel exhilarated. It snowed on Christmas day, a storm that left us about eight inches of light, fluffy snow. Nothing unusual for central Maine. Naturally, this meant we had to clean up the snow, but as the saying goes, many hands make the task light. 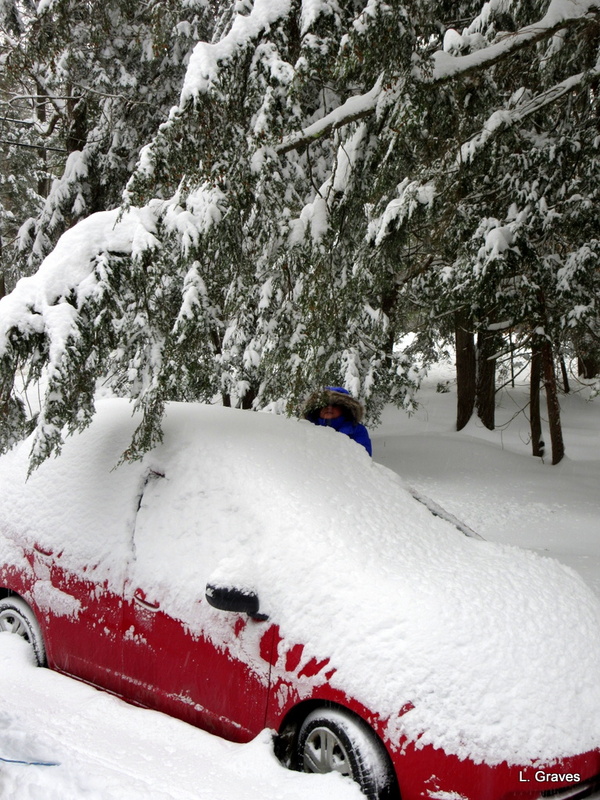 Here is Shannon, just barely visible in her blue parka, cleaning our car. Here is our front deck, after it was shoveled. Then, as it sometimes happens in Maine in the winter, it got very, very cold. 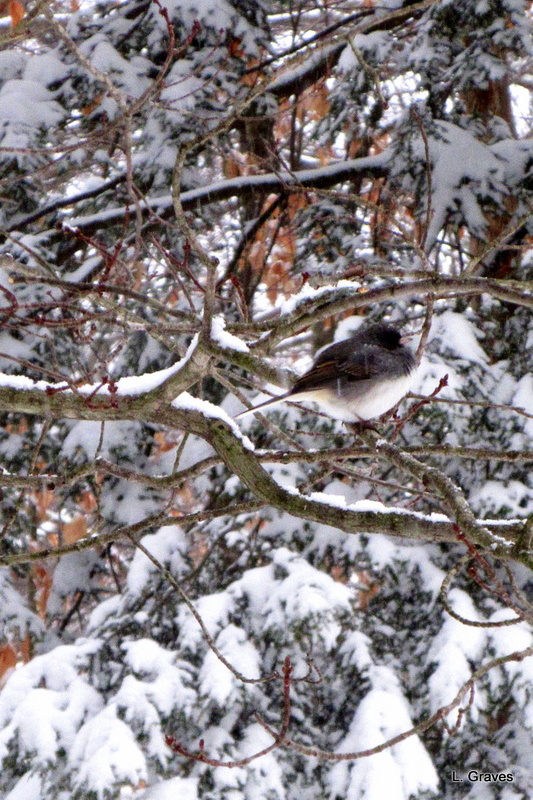 This little junco is puffed up against the cold. We are diligent about keeping the feeders filled for them and for the other birds. 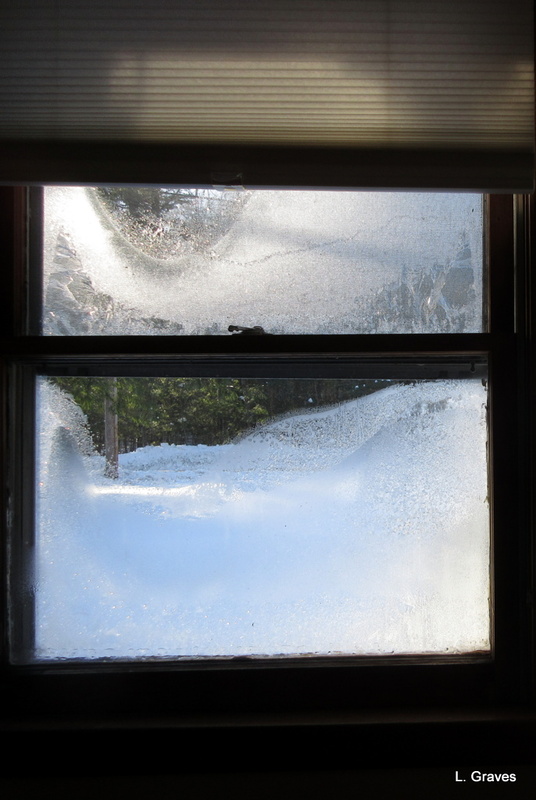 It is so cold, that the windows in the bedroom are frosted. But our backyard looks like a winter wonderland, so all is forgiven. Maine is not the northern-most state in our country, but in the winter, we definitely feel as though we are north of north. Snow, cold, quiet, and a hunkering down for the winter give us the illusion of being separate from the rest of the country. How far removed Washington feels, almost as though it is on another planet. This, of course, is false thinking. What happens in Washington ripples outward and upward, affecting us all. But during this time of stillness and cold, I can almost pretend that time has slowed down, allowing us to focus on movies, books, and tea with friends. And speaking of movies…we saw four good ones over the holidays, all worth putting on your list if you are a movie buff. Our favorite was Darkest Hour, about Winston Churchill and England’s decision to enter World War II. A couple of times I was moved to tears, especially as the little civilian fleet left to rescue the soldiers at Dunkirk. Oh, my! Then, there is Churchill’s famous “We shall fight on the beaches” speech. My second favorite was Downsizing, a parable about climate change, our overconsuming ways, and bright spots of decency. No answers are provided, and the silly sight of a shrinking Matt Damon does not detract from the serious message of this movie. Third was All the Money in the World, about the kidnapping of Paul Getty III. Christopher Plummer replaced Kevin Spacey in playing Getty the elder, and Plummer did an outstanding job, especially when you consider his scenes were filmed in just nine days. As for all that money? Too much for one person. Too much. Finally, we saw the latest Star Wars movie, which was good enough, but it just didn’t have sparkle. The plot was too basic and involved too much chasing. Still, it was wonderful to see Carrie Fisher in her last role—how good she was!—as well as some bright spots that were, alas, not allowed to shine long enough. It’s been a good year for movies, and there are more to look forward to, perfect for this cold time of year. So now onward, ho to January and February. I’ve been feeling a little blue too! Your state isn’t equipped to deal with snow and cold the way our state is. Stay warm. Hope tomorrow’s blizzard doesn’t hit you too hard. Right now we’re a little bit too much inland and so I don’t think it’s going to be that bad – it’s mostly a coastal storm. But not by that much and so it wouldn’t take much of more inland track for us to get hit – which would mean we probably would be housebound until Sunday! 😛 We’ll see and be prepared in case! You and Dad stay warm and dry too!! Righto! Always good to be prepared. Yesterday, we bought a bottle of lamp oil at Reny’s. It certainly looks lovely in the snow but I am glad we don’t have those low temperatures. I’m finally getting out of denial about the temperature. Went for a brisk walk today in nearly balmy 11 above. Heat wave tomorrow when it hits 20! Wowza! This post left me feeling teary eyed here in warm and ever sunny southern California…your words are very touching and I appreciate your comments on winter and movies…(the story of the fishermen saving the boys on the beach at Dunkirk always makes me cry). The worries of the world do press in as we celebrate the earth renewed after our darkest day and we hold on to all that is good about being alive! And your comment left me in tears. Oh, those brave fishermen! And a very happy New Year to you and yours. I am glad that some consolation for the freezing temperatures can be gained from the winter wonderland in your yard. It is interesting that we are a good bit further north than you but a lot milder. Three cheers for the Gulf Stream. It’s beautiful, cold, and a little harsh. Fortunately, we have a wood furnace that will heat our home even if the power goes out. Over here keeping the fires burning, the tea kettle hot, and the critters fed….and our movie on New Yers’s day, Dr. Zhivago ( the original, of course). Happy New year’s, friends! B-r-r-r. A suitably cold movie for New Year’s Day. Stay snug during tomorrow’s storm. My goodness! That is cold! Your winter wonderland photos are so pretty but what hard work it is shoveling snow! Happy New Year to you all! Very cold! A lot of work shoveling snow. 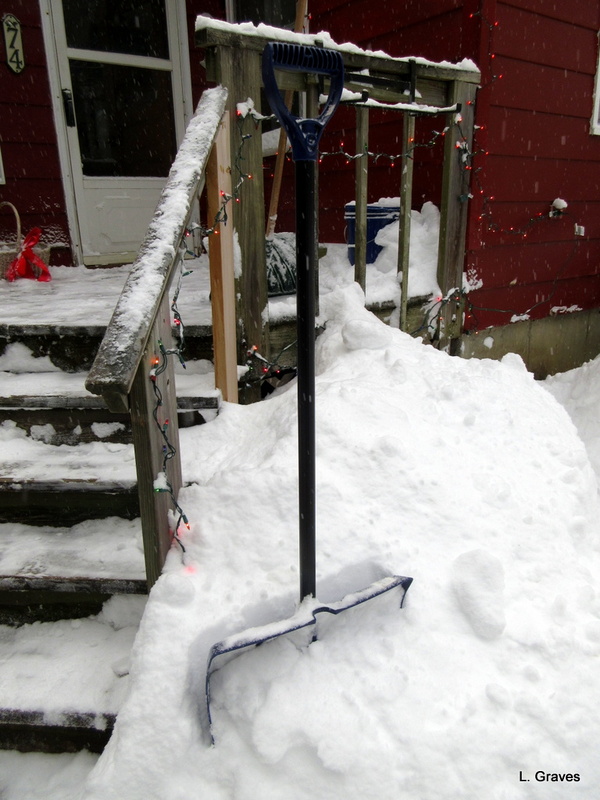 Fortunately, we have a little electric snow thrower that makes the job easier. I’ll be sure to get a picture of Clif with “Little Green” so that you (and other readers) can see him in action. Happy New Year to you and yours! That is cold, Laurie! The coldest it has been here is around 22 degrees a number of mornings in December. No snow, yet. The agricultural forecast says we are going to have a warmer than normal winter this year. We will see! Very cold! That jet stream! Hope the weather holds for you. 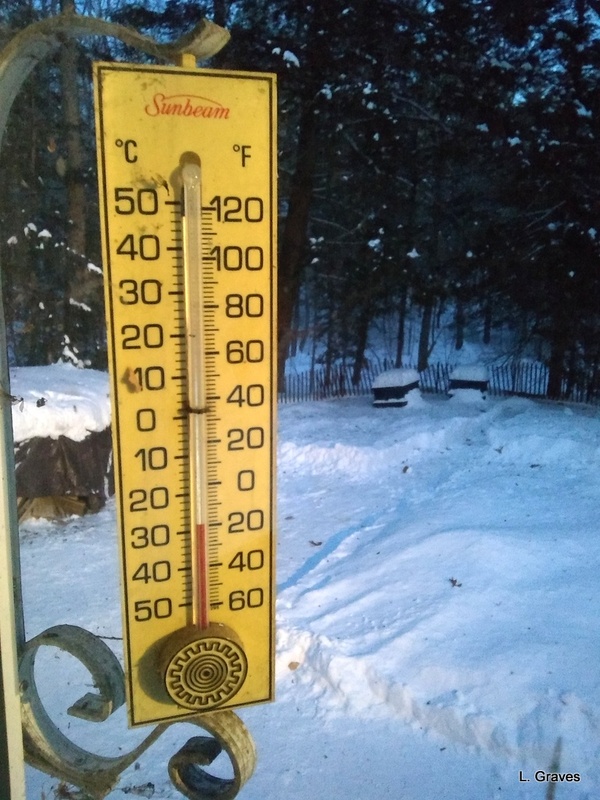 Thanks for an interesting post, both Paul (my husband) and I have never been to Maine, or experienced such temperatures, (living in Canberra Australia) so it was good to see it up close, and on a personal level. As enjoyed your movie list, we’ve definitely added a few to ours. Just took a look at your blog and I am now following it. Beautiful photos and very exotic to this Mainer. Funny how that works, isn’t it? Glad you enjoyed the pictures of our Maine winter. A blizzard is blowing up the East Coast, so there will be more snow to come. Hope you enjoy the movies. Welcome Laurie… Despite the difference in landscape and weather I’m sure we have lots in common…I always enjoy your posts. And I am agog over your photos! Look forward to seeing and reading more. Oh my goodness! That is SO cold! You really have experienced extreme weather within the last 6 months. Love to see your photos. And then I watched ‘Girl with a Pearl Earring’ for the umpteenth time – I just love that film and saw it three times in the Cinema when it came out. The DVD has Special Features about how the film was made – mmmmmm – almost edible! The painting itself has long been one of my favourites, I was given a print of it for my 14th birthday. In Maine, we are used to cold weather, but our cold snaps usually don’t last this long. I loved “The Girl with the Pearl Earring.” I’ll be on the lookout for “The Miniaturist.” Right now, we are watching “Alias Grace.” Just saw the first episode but so far very good. 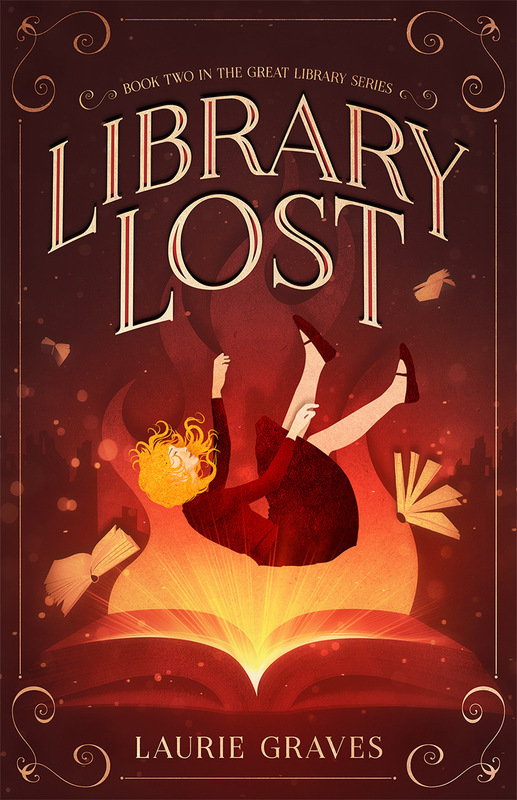 It’s adapted from a novel by Margaret Atwood. After the holidays is always a letdown, especially as our children no longer live nearby. Our time with them is very precious because of this. It is beautiful, Laurie, and you have just the right attitude to be a Maine-er. It’s not for the faint of heart! You’re due for another big wallop of snow, I believe–I think this one is missing us but the wicked, bitter cold continues . . .
Not at all for the faint of heart! Yes, here comes another storm. Fingers crossed, and toes as well, that we keep our power. Fingers crossed that we don’t all lose power in this upcoming storm. With the cold weather to follow, it could be ugly. Stay warm and happy! I’m going to take advantage of this relatively warm day to go x-country skiing and then back to the cozy house. Yup, yup. Here comes another one. So far, for central Maine, the wind looks strong but not completely damaging. We shall see. Snow accumulation is predicted to be around 9 inches. Nothing unusual there. It all comes down the keep the power. Fortunately, we have a wood furnace and plenty of wood, so we will stay warm. Fingers, fingers crossed about the power. So far, in central Maine, it doesn’t look too bad. Predicted snow accumulation is 9 inches, and the wind at 25 to 35 mph. Strong, but not necessarily knock-out power strong. We shall see. Again, fingers crossed. I think the storm will be stronger at the coast, and I hope you don’t get hit too hard. Great photographs, as usual, Laurie. We’ve just said goodbye to our Christmas staying guests – even though we’ll see them often, it was a “sad moment”. Thanks, Derrick! Always sad when “the kids” leave. And ours live so far away. Sigh. How lovely to see your beautiful snowy pictures, but my word that’s cold. Here we continue to have rain and wind and I’m glad that I have a roof over my head! Wonderful winter photos and I would like a little more snow and a return to our normal cold temperatures instead of this freezing cold.🙂 We plan on seeing Darkest Hour and I loved Star Wars. Normal winter cold would be grand. My daughter Shannon and our son-in-law Mike loved Star Wars, too. I am late in reading your post and sit here as the snow has begun to fall again. I always get choked up as Lisa leaves and try not to shed too many tears as I hug her goodbye. We cherish those family times and the cold weather in some ways brings us us closer. Happy New Year and now we can look forward to warmer weather when the girls come again. Beth, I know just what you mean. Your comment about Lisa brought tears to my eyes. How we love our best beloveds! I definitely want to see Darkest Hour and All the Money. We’ve seen the Last Jedi and enjoyed it. We also have seen Ladybird, which I would recommend. Ladybird came and went before we had a chance to see it, but we are hoping it will be brought back during Academy Award season. Thanks for movie recommendations, from just north of you in New Brunswick. You’re most welcome! You are certainly north of north. The snow’s gorgeous, but after 40 Minnesota winters all I can think is how glad I am not to have to shovel it anymore. I live in Cornwall–the southwestern tip of Britain–and people here complain about the winter (it’s wet and it windy, and I’ll admit it does get chilly), but my partner and I think we’ve moved to the tropics. We do have to join in the complain-about-the-weather-athon, though. It’s a bonding ritual. If we didn’t, I don’t think any of our neighbors would speak to us again. I know a lot of people who feel the way you do. Many head south during the winter. I understand. I really do. But I’m such a Mainer that at least right now, I can’t imagine winter without lots of snow. I love the quiet, the clarity of the air, the deep blue skies. Some of us were just born to live in the north. 😉 And, yes, of course you must commiserate about the weather. Nothing worse than a wet blanket who likes to remind folks that the weather was so much worse where he or she came from.